Draft: 2005, Philadelphia Phillies, 12th rd. Mike joins the Cubs as a non-roster invitee to major league Spring Training after signing a minor league contract in December of 2018 ... appeared in the majors with Milwaukee last season, his first major league action since the 2013 season ... Has appeared in parts of six major league seasons with Philadelphia (2007, 2010-11), Arizona (2012), Pittsburgh (2013), New York-A.L. (2013) and Milwaukee (2018) ... has gone 1-1 with a 7.78 ERA (66 ER/76.1 IP) in 91 relief outings ... Has gone 29-24 with a 3.04 ERA (166 ER/491.2 IP) in 399 minor league appearances, all but 10 as a reliever ... was named an International League mid-season All-Star in 2011 with Lehigh Valley ... Spent the 2015 and 2016 seasons in Japan's Nippon Professional Baseball League ... posted a 4.15 ERA (22 ER/47.2 IP) in 51 relief outings during that stretch ... Missed the entire 2008 season due to reconstructive surgery on his left elbow ... Attended Hutchison Community College before transferring to the University of Kansas ... Graduated from Millard North (Neb.) High School. Mike spent the entire year in the Brewers organization and made his first major league appearance since the 2013 season ... appeared in two games with Milwaukee, allowing seven runs in 1.0 inning ... Spent the majority of the season with Triple-A Colorado Springs, going 1-1 with a 3.20 ERA (16 ER/45.0 IP) in 49 relief outings ... struck out 66 batters, while walking 17 ... Was selected to Milwaukee's major league roster June 28 ... appeared in two contests before being designated for assignment July 8 and outrighted to Colorado Springs. In his first season in the United States since 2014, Mike went a combined 2-4 with a 3.29 ERA (10 ER/27.1 IP) in 25 relief appearances between Double-A Erie and Triple-A Toledo in the Detroit system. Went 3-1 with a 4.96 ERA (18 ER/32.2 IP) in 32 outings with the Yokohama Bay Stars of the Nippon Professional Baseball League. Posted no record and a 2.40 ERA (4 ER/15.0 IP) in 19 outings with the Hiroshima Carp of the Nippon Professional Baseball League. Split the season between Triple-A Columbus (Cleveland Indians) and Triple-A Buffalo (Toronto Blue Jays), going 4-1 with a 2.08 ERA (14 ER/60.2 IP) in 46 outings ... posted a 1.83 ERA (9 ER/44.1 IP) in 30 games with Buffalo ... Began the season with Columbus but was released May 24 ... signed a minor league contract with Toronto May 30 and was assigned to Buffalo. Split time in the Yankees, Pirates and Athletics organizations in 2013, compiling a combined Triple-A record of 6-3 with 2 saves and a 3.04 ERA in 45 relief appearances (53.1IP, 44H, 18ER, 24BB, 83K), averaging 14.0 strikeouts per 9.0IP... Started the year in AAA Indianapolis and was with the Pirates from May 27-June 15 before being designated for assignment (later refused assignment and became a free agent)...Signed with the Yankees organization on June 21 before August 15 release (signed with Oakland)...Following Minor League season he signed with the Yankees and made one appearance in September with the Yankees...RH Minor League batters hit .237 (32-135) off him and LH Minor League hitters batted .253 (23-91). Began season with Reno (Diamondbacks' AAA)...Was scored upon once in his six appearances with the Aces before having contract selected by Arizona on 4/24...Was one of 15 pitchers in the Majors with at least 45 appearances and no losses...Did not allow a run in 29 of his 45 appearances...Allowed 12 of his 31 inherited runners (39%) to score...Tied his career high with 2.0 innings of relief in debut with the Diamondbacks on 4/24 vs. Philadelphia...Allowed four runs in 1.0 inning on 8/10 vs. Washington and was designated for assignment the following day...Was selected by Arizona on 8/14...Recorded a 3.72 ERA (9.2ip/4er) in 13 games during second stint with the Diamondbacks. Spent the majority of the season with Triple-A Lehigh Valley, going 4-0 with a 2.65 ERA (16 ER in 54.1 IP) and 11 saves in 46 games...also made 4 relief appearances over 2 stints with the Phillies (2 ER in 3.1 IP)...Was named to the International League midseason All-Star Team...tied for fourth in the IL with 9 holds...Claimed off waivers from the Phillies on Sept. 22...Adam Worthington was then sent to the Phillies to complete the transaction on Nov. 15.♦ Played with Oriente of the Dominican Winter League. Had "Tommy John" reconstructive surgery on his leftelbow (Dr. James Andrews), 4/4, and missed the entire season. Pitched at 4 levels in the Phillies organization and won the Paul Owens Award as the best pitcher in the team's minor league system... Began the season with Clearwater (A), where 11 of his 12appearances were scoreless and he averaged 16.5 SO/9.0 IP... Held Florida State League hitters to a .113 average... Waspromoted to Reading (AA) in May and appeared in 6 games (5 scoreless) before having his contract purchased on 5/25...Made his ML debut, 5/25 at ATL (1.0 IP)... Earned his 1st ML win, 6/7 at NYM (1.0 IP, H, BB, SO)... Was optioned to Ottawa on7/27... Appeared in 7 games before being recalled on 8/15... Overall, went 0-0, 1.39 ERA (5 ER, 32.1 IP) in 25 minor leaguegames and averaged 13.6 SO/9.0 IP (49 SO/32.1 IP)... Was recalled on 8/16... Stumbled trying to field a ground ball off thebat of Ronny Paulino and was taken out of the game, 8/18 at PIT... Was placed on the 15-day DL on 8/19 (strained righthamstring)... Had season-ending surgery on his right hamstring on 8/27 (Dr. Jim Bradley). Made his pro debut with Rookie Batavia, going 3-4 with a 4.60 ERA (23 ER in 45.0 IP) in 15 games (8 starts). 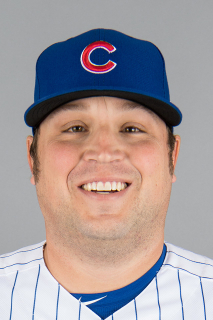 March 23, 2019 Chicago Cubs released LHP Mike Zagurski. February 1, 2019 LHP Mike Zagurski assigned to Iowa Cubs. December 19, 2018 Chicago Cubs signed free agent LHP Mike Zagurski to a minor league contract and invited him to spring training. November 20, 2018 Estrellas Orientales placed LHP Mike Zagurski on the reserve list. October 15, 2018 LHP Mike Zagurski elected free agency. October 13, 2018 LHP Mike Zagurski assigned to Estrellas Orientales. July 12, 2018 Milwaukee Brewers sent Mike Zagurski outright to Colorado Springs Sky Sox. July 8, 2018 Milwaukee Brewers designated LHP Mike Zagurski for assignment. June 28, 2018 Milwaukee Brewers selected the contract of LHP Mike Zagurski from Colorado Springs Sky Sox. February 23, 2018 LHP Mike Zagurski assigned to Milwaukee Brewers. January 19, 2018 LHP Mike Zagurski assigned to Colorado Springs Sky Sox. December 21, 2017 Milwaukee Brewers signed free agent LHP Mike Zagurski to a minor league contract. June 15, 2017 Erie SeaWolves released LHP Mike Zagurski. June 12, 2017 Erie SeaWolves placed LHP Mike Zagurski on the 7-day disabled list. Hamstring injury. May 22, 2017 LHP Mike Zagurski assigned to Erie SeaWolves from Toledo Mud Hens. April 21, 2017 LHP Mike Zagurski assigned to Toledo Mud Hens from Erie SeaWolves. March 31, 2017 LHP Mike Zagurski assigned to Erie SeaWolves from Toledo Mud Hens. March 26, 2017 LHP Mike Zagurski assigned to Detroit Tigers. February 8, 2017 Detroit Tigers signed free agent LHP Mike Zagurski to a minor league contract. February 8, 2017 LHP Mike Zagurski assigned to Toledo Mud Hens. September 2, 2014 Buffalo Bisons released LHP Mike Zagurski. May 30, 2014 Toronto Blue Jays signed free agent LHP Mike Zagurski to a minor league contract. May 30, 2014 LHP Mike Zagurski assigned to Buffalo Bisons. May 24, 2014 Columbus Clippers released LHP Mike Zagurski. April 3, 2014 LHP Mike Zagurski assigned to Columbus Clippers. November 22, 2013 Cleveland Indians signed free agent LHP Mike Zagurski to a minor league contract and invited him to spring training. October 17, 2013 LHP Mike Zagurski assigned to Estrellas de Oriente. October 4, 2013 LHP Mike Zagurski elected free agency. October 3, 2013 New York Yankees sent LHP Mike Zagurski outright to Scranton/Wilkes-Barre RailRiders. September 10, 2013 New York Yankees signed free agent Mike Zagurski. September 2, 2013 Sacramento River Cats released LHP Mike Zagurski. August 18, 2013 LHP Mike Zagurski assigned to Sacramento River Cats. August 17, 2013 Oakland Athletics signed free agent LHP Mike Zagurski to a minor league contract. August 16, 2013 Scranton/Wilkes-Barre RailRiders released LHP Mike Zagurski. June 21, 2013 LHP Mike Zagurski assigned to Scranton/Wilkes-Barre RailRiders. June 20, 2013 New York Yankees signed free agent LHP Mike Zagurski to a minor league contract. June 19, 2013 LHP Mike Zagurski elected free agency. June 18, 2013 Pittsburgh Pirates sent Mike Zagurski outright to Indianapolis Indians. June 15, 2013 Pittsburgh Pirates designated Mike Zagurski for assignment. May 27, 2013 Pittsburgh Pirates selected the contract of LHP Mike Zagurski from Indianapolis Indians. December 1, 2012 Pittsburgh Pirates signed free agent LHP Mike Zagurski to a minor league contract and invited him to spring training. November 1, 2012 LHP Mike Zagurski elected free agency. August 14, 2012 Arizona Diamondbacks selected the contract of LHP Mike Zagurski from Reno Aces. August 13, 2012 Arizona Diamondbacks sent Mike Zagurski outright to Reno Aces. August 11, 2012 Arizona Diamondbacks designated Mike Zagurski for assignment. April 24, 2012 Arizona Diamondbacks selected the contract of LHP Mike Zagurski from Reno Aces. April 4, 2012 Arizona Diamondbacks sent Mike Zagurski outright to Reno Aces. October 14, 2011 LHP Mike Zagurski assigned to Estrellas de Oriente. October 10, 2011 Mike Zagurski roster status changed by Arizona Diamondbacks. October 1, 2011 Arizona Diamondbacks reassigned LHP Mike Zagurski to the minor leagues. September 26, 2011 Arizona Diamondbacks activated LHP Mike Zagurski. September 23, 2011 Philadelphia Phillies traded LHP Mike Zagurski to Arizona Diamondbacks. September 17, 2011 Philadelphia Phillies designated Mike Zagurski for assignment. June 5, 2011 Philadelphia Phillies optioned LHP Mike Zagurski to Lehigh Valley IronPigs. May 31, 2011 Philadelphia Phillies recalled Mike Zagurski from Lehigh Valley IronPigs. April 29, 2011 Philadelphia Phillies optioned Mike Zagurski to Lehigh Valley IronPigs. April 19, 2011 Philadelphia Phillies recalled Mike Zagurski from Lehigh Valley IronPigs. March 26, 2011 Philadelphia Phillies optioned Mike Zagurski to Lehigh Valley IronPigs. October 25, 2010 Mike Zagurski roster status changed by Philadelphia Phillies. October 5, 2010 Philadelphia Phillies reassigned LHP Mike Zagurski to the minor leagues. September 6, 2010 Philadelphia Phillies recalled Mike Zagurski from Lehigh Valley IronPigs. July 8, 2010 Philadelphia Phillies optioned Mike Zagurski to Lehigh Valley IronPigs. June 22, 2010 Philadelphia Phillies recalled Mike Zagurski from Lehigh Valley IronPigs. March 22, 2010 Philadelphia Phillies optioned Mike Zagurski to Lehigh Valley IronPigs. November 9, 2009 Mike Zagurski roster status changed by Philadelphia Phillies. April 25, 2009 Mike Zagurski assigned to Reading Phillies from Clearwater Threshers. April 23, 2009 Philadelphia Phillies optioned Mike Zagurski to Clearwater Threshers. April 23, 2009 Philadelphia Phillies reassigned LHP Mike Zagurski to the minor leagues. April 17, 2009 Philadelphia Phillies sent LHP Mike Zagurski on a rehab assignment to Clearwater Threshers. June 9, 2005 Philadelphia Phillies signed LHP Mike Zagurski.